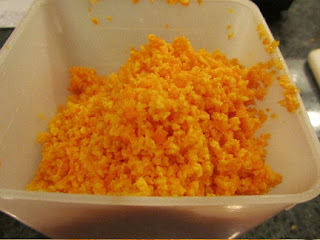 For a fresh zing to add to baked goodies, I add a pinch of orange zest, that I keep safely tucked away in the freezer. I save enough zest over the course of the winter, that I often still have some left, when the cranberries come in the next October. And cranberry-orange bread is very yummy! 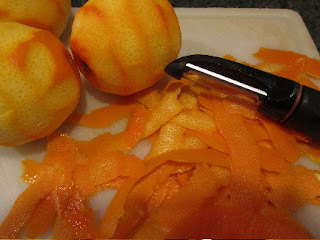 Here's my easy way to zest oranges. You'll need a vegetable peeler, freezer and food processor. No food processor? At the bottom of the post is how I chop the strips of peel by hand. Before peeling an orange to eat fresh, I wash the outside of the orange with a drop of liquid dish detergent, and rinse well. Then I use a vegetable peeler to remove just the zest of the orange, in wide strips. I keep these strips of orange zest in a container in the freezer, until I have enough to run them all through the food processor, still frozen. We go through about a dozen oranges, over the course of a week. But there have been times when it took a month to accumulate enough strips to do a batch in the food processor. 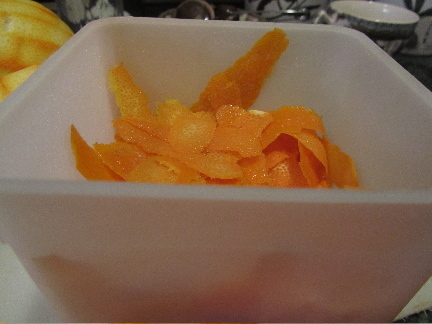 If I happen to be using a lemon or grapefruit, I peel and add those to the orange strips. 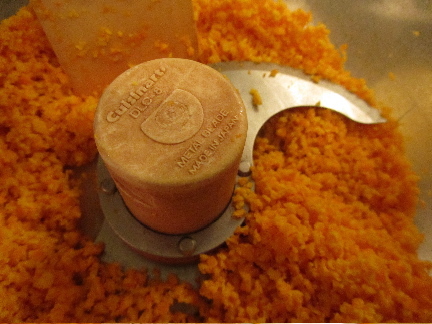 In my food processor, with the blade attachment, I process about 1 1/2 to 2 cups of the orange peel strips at a time. My food processor has a 7 cup capacity, so that's about 1/4 of the fp's capacity at a time. I pulse, to break the peels into smaller pieces, cleaning the ends of the blade from time to time. If a bit of peel gets stuck between the blade tip and the bowl, it will slow the machine's function just enough to fail to break the peels down into small bits. So, when it looks like my peels are not getting chopped, I check the blade tips, and just scrape out any hunks that are stuck. Once processed, I scoop this all back into the freezer containers, and keep frozen until I wish to use some in baking. It breaks apart easily enough to scoop out a spoonful or two at a time. The next time you make cranberry bread, scones or muffins, try adding a couple of teaspoons of this orange zest to the batter. The cranberry and orange flavor combination is wonderful! 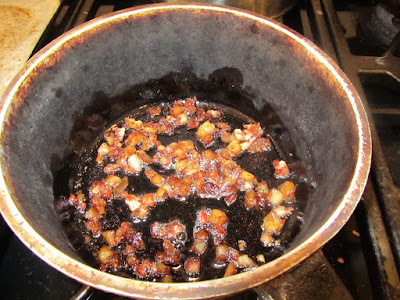 I also like a bit of orange zest in plum desserts, cherry pie and rhubarb sauce. When I need zest and don't have enough strips to run through the fp, or just don't want to dirty it, and so have to wash it ; ) here's how I get the most zest from an orange, in a hurry. 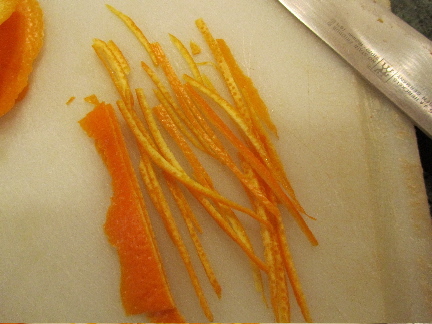 Using a vegetable peeler, I remove strips of orange peel, just as above. Then on a cutting board, with a sharp knife, I shred these strip into fine julienne (it goes much faster than you'd think). It turn the julienne strips sideways, and chop away. That easy! And the zest doesn't get trapped in a grater or zester. Good info. 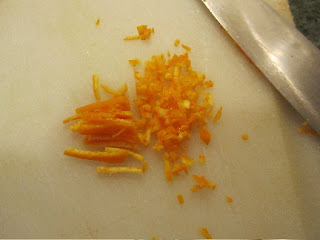 I always worry about my knuckles when I use a grater to zest an orange especially if it's not very big. Me, too! And when grating carrots, as well. Ouch! It hurts just to think about it. Great idea :) I would never have thought of storing orange zest in the freezer but it makes a lot of sense. It also means you can stock up on lemon zest when lemons are in season and use the zest all year round. Thanks. The great thing about storing citrus zest in the freezer is that quality of texture isn't compromised. That's usually an issue with freezing fruit. It's not the same, texture-wise when thawed, as it was fresh. Citrus zest retains most of it's original texture. This is a great idea! I like using citrus zest in pies, cookies, dressings, and certain meals. I'll give this a whirl. Thank you. You reminded me, I like to add some zest to salad dressings, as well. And lemon zest can be added to marinade for lemon-rosemary chicken, some lemon juice, lemon zest, garlic, oregano, rosemary, salt and pepper. Great on the bbq. Can't wait for bbq season to return! thanks. 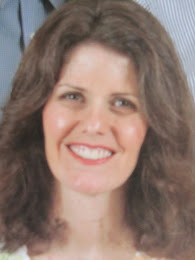 It's that very thrifty side of me, peeking out again! Lili, I just read a post on how to make orange and lemon extract. It's just like vanilla extract, only it uses citrus peels. Is that infusing the peel in vodka? I read something about making lemon essence a while back. I was thinking of using homemade lemon essence in place of lemon essential oil in the furniture polish that I make. Thanks for the reminder. Which site had the recipe you were looking at?